Like many suburban mothers, I spend most of my time picking up various items and putting them elsewhere: like where it belongs, or simply to a place where it won’t end up tucked in the explanatory note on an insurance claim form. When I am not picking up the flotsam and jetsam brought in on the current of people that occupy this house as residents and guests, I am telling someone else to assign a different locale to whatever foreign object is blocking my path. To wit: nerf gun ammunition, large hard cover editions of graphic novels, enormous pads of paper soaked in puddles of crayons, squeeky dog toys that look startlingly lifelike, gym bags filled with moldy swimsuits with towels to match: these are the props that enliven the snap shot of my Sunday evening. Contributing to the visual feast: briefcases, neck ties, size 11 monk strap shoes and towers of Amazon boxes. There are entire volumes, television shows and newspaper columns dedicated to how to keep it all organized, how to hide the stuff, to keep it tucked away from yourselves and others to give the illusion that the household is run with efficiency and care. We’ve tried the basket trick, the California closet scheme and the monthly Good Will donation approach. But there are still little elves that take things out of their neat, compartmentalized homes and leave it on the floor to break my stride. Many of the contingent of villager moms that make up my tribe joke that Monday, when all the children have returned to their classrooms, is “Take Back The House Day,” when kitchens are tidied, laundry is done, and all the stuff that carpets our floors are dumped into their respective bedrooms. The children return on Monday evening too tired to do anything but slurp their soup, scramble through their homework, and fall into bed. The house remains as though normal human beings live there, if only for a day. I had that in spades this week, as most of my contingent is on holiday while I stayed behind with a sick baby. It’s amazing what can be accomplished if three of the five mess makers are out of the house. So it’s entirely baffling that the order that exists in my house today that should induce feelings of comforting control over damning chaos, actually makes me uneasy with loneliness. It’s as if the Windex not only wiped away my children’s fingerprints laid on the kitchen counter during a science experiment (drawing DNA strands from an onion by a complex olive oil soaking technique). It also took away evidence of their existence, a hungry, curious one that yearns to find an answer to every dumb founding question. I am bewildered that as I sit in my dining room, where my daughter’s journals normally reside in a tangled pile, I feel uncomfortable with the empty shine that gleams on it. The books on the dust-free, lemon Pledged living room coffee table are stacked neatly. The laundry is fluffed, folded and put away, the hallways and stairwells are clear. There are no tiny pieces of plastic to stab the arches of my feet in the kitchen and I can listen to NPR all day if I’d like. 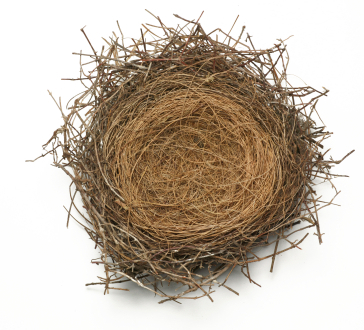 In this tidy weave of a soulless empty nest, I can think of one consolation: the sterility will not last but a few more days, and that is sufficient. The tangle of toys and books are reminders of my children’s fleetingly whimsical age that enlivens my own. Upon their return I will greet them with not only a bowl of hot soup, but a clean workshop in which to tackle whatever project fancies them. What will engage them in later years may actually be outside of this cocoon, so I will gather these Herrickian rosebuds while I may. I’ll save the nagging for next week, when phantom insurance claim forms are sure to haunt me again.